Greyhound racing is mainly popular in the UK, USA and Australia and consists one of the most popular forms of gambling in these areas. 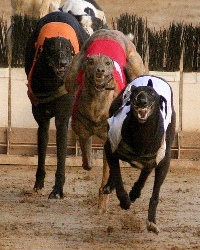 The race takes place as number of greyhound dogs chase a lure on the track till arriving to the finishing line. First greyhound to arrive to the finish line is the race’s winner. Greyhound Racing is one of most interesting and attracting sports in the USA, UK countries and Australia. Just like Betting on Horse Racing, the main interests in this sport is the betting opportunities, and therefore Racing Betting Online is happy to provide the details for your Greyhound Racing Betting. Like other Racing Betting sports, you will need to learn more about the Greyhound Betting specifically, before placing the first online bet. • Straight bet or Single or Win bet – bet on the winning greyhound at to end the race. This is the most simple and basic bet and if you have the right information, most likely you will win this bet. • Place – Bet on the Greyhound to finish first or second, meaning you will win whether the greyhound you chose finishes either first or second in the race. • Show – Wager on the greyhound to finish first, second or third in the race. • Across The Board – this is a combined wager of the Win, Place and Show bets where as the cost of the bet will be x 3 and the winning will be based on the odds offered by the sportsbook. • Combination Bet – Choose several dogs to finish first in the race with lower odds. • Quiniela or Reverse Forecast (UK) – Bet on the dogs to finish first and second at the end of the race. • Perfecta or Exacta or Straight Forecast (UK) – Choose the dogs to finish first and second by the exact (Exacta) order. • Trifecta or Tricast or Treble Forecast (UK) – Same as the Exacta only refers 3 dogs and the exact order they finish the race. • Superfecta – Same as the Perfecta and Trifecta just refers to 3 dogs and the order or finishing the race. • Twin Trifecta – This is a double trifecta bet which carries to the next race. Bet a Trifecta (3 dogs to finish first in the exact order) in 2 sequential races. • Tri-Super – Similar to the Twin Trifecta. You select the winning Trifecta combination in one race and exchange that ticket for a Superfecta in the following race. • Titanic Tri- Super This operates the same as the Tri-Super, except you must correctly select the Trifecta combination in the 5th Race and the Superfecta in the 7th Race. • Daily Double – Bet on the winners of the first and second race in a row. • Jackpot – Pick 6 dog winners in 6 different races and share a jackpot if you get all of them correctly. • Parlay or Accumulator – Betting on several races and using the winnings of a prior race on the same bet, for the next race. • Pick 3 – Picking the winners of three consecutive races. • Pick 6 – Picking the winners of six consecutive races. While these bet types may not be available in one sportsbook, it may be available at another. More information can be found in our Sportsbook section and in the Greyhound Racing information notes.